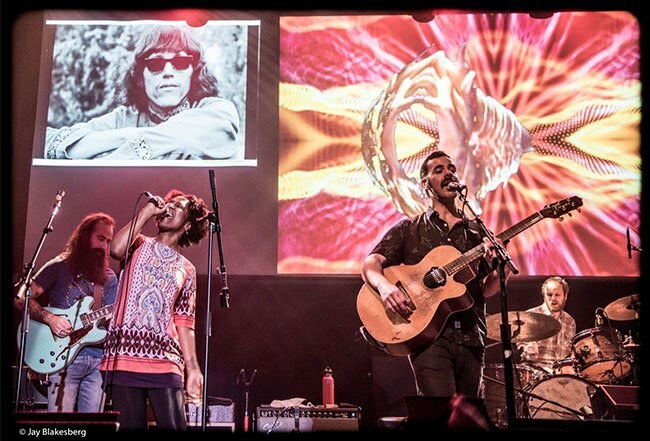 An all-star cast of Bay Area musicians gather for a magical night featuring the hippie hits of 1967. The year 2017 marks 50 years since the historic “Summer of Love” in San Francisco, as well as five decades since Jefferson Airplane’s landmark Surrealistic Pillow album helped catapult the socio-cultural musical revolution that put the San Francisco music scene on the map. Some veteran insiders have suggested that the real “Summer of Love” took place in 1966, before the influx of outsiders that led the scene to start collapsing under its own weight. But the fact that Jefferson Airplane’s first album with Grace Slick came out in January 1967, followed shortly thereafter by the Grateful Dead’s debut LP, makes 1967 a pivotal year in music history. 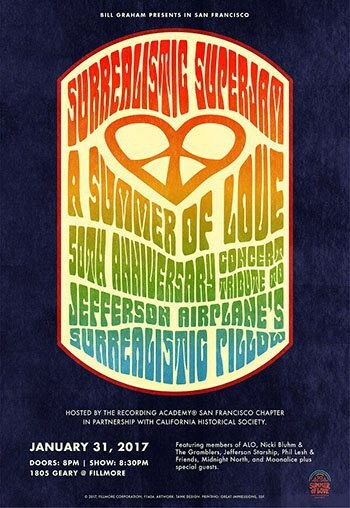 The San Francisco Chapter of the Recording Academy (which sponsors the Grammy Awards) and the California Historical Society, therefore, chose to honor the occasion by gathering a collection of artists from the modern Bay Area music scene for a “Surrealistic Superjam” to honor the anniversaries of 1967’s monumental musical moments. The show turns out to be an industry event, but the academy democratically offers tickets to the public as well for a bargain price of $20. Not a single actual musician is named in the promos, but the show is billed to include members of Animal Liberation Orchestra (ALO), Nicki Bluhm & the Gramblers, Jefferson Starship, Midnight North, Moonalice, Tea Leaf Green, the Terrapin Family Band, Cosmic Twang, Brothers Comatose, the California Honeydrops and New Monsoon. It’s plain to see this will be a Bay Area all-star event. 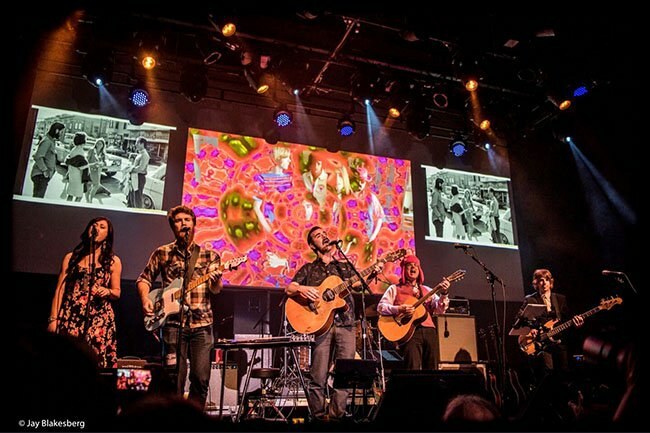 Guitarist Dan “Lebo” Lebowitz from ALO is the musical director for the show as it turns out, a superb choice since he’s become one of the leading “Terrapin Allstars” at Grateful Dead bassist Phil Lesh’s Terrapin Crossroads (TxR) club in nearby San Rafael. The Terrapin Allstars specialize in putting together jam sessions with whatever musicians happen to be around, but it soon becomes clear that this show is well orchestrated. “We’re celebrating songs that came out of 1967”, Lebo announces with pride as prelude to what turns out to be a magical night featuring the hippie hits of 1967. Guitarist Grahame Lesh (Phil’s 30-year-old son) and Midnight North bandmate/vocalist Elliott Peck both join Lebo and ALO/Gramblers bassist Steve Adams to start the show along with Terrapin Allstars Ezra Lipp and Jason Crosby on drums and keyboards for a stellar rendition of the traditional “Cold Rain and Snow” that opened the Dead’s debut album. There’s a genuine musical synergy in the air from the start, with Lesh and Lebo both taking hot solos as the band jams the song out to announce that this will indeed be a jam session. Lebo, Adams, Lipp and Crosby form the superjam’s core quartet for most of the night, accompanied by a truly surrealistic rotation of all-star performers. Crosby makes a surprise move to guitar to sing a duet with Roger McNamee of Moonalice on a superb reading of Buffalo Springfield’s “For What It’s Worth”, with Pete Sears manning the keyboards. It’s here that the evening starts to take on the socially conscious flavor that marked the music of the late ‘60s, an urgently needed theme at the beginning of Donald Trump’s foul presidential era. When the ensemble sings of “battle lines being drawn” and “stop, what’s that sound, everybody look what’s going down”, the revolutionary vibe of the ‘60s is conjured. Members of the California Honeydrops then star on Otis Redding’s “Sitting on the Dock of the Bay”, with the charming Peck dancing and dueting on the vocals while ace keyboardist Scott Guberman from the Terrapin Allstars sits in on piano. The ensemble then pulls a trick out of their hat by launching into the Airplane’s seminal “White Rabbit” instead of saving it for the end. The psyche-rock classic features Pete Sears laying down the powerful bass line, Terrapin Allstar / Family Band / Cosmic Twang guitarist Ross James on fiery lead guitar and vocalist Paula Frazer conjuring Grace Slick’s surrealistic persona. 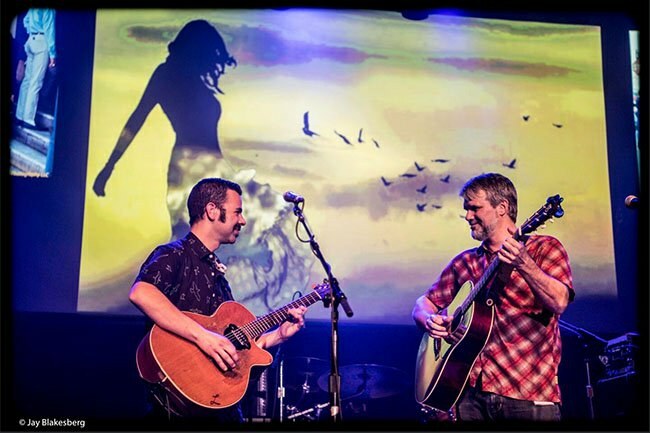 A very short break in the action follows with Lebo and New Monsoon’s Bo Carper returning for a duo performance of Surrealistic Pillow’s “Embryonic Journey”, the Jorma Kaukonen instrumental classic. Lebo seems to delight in letting Carper take the lead, adding accents for a stellar performance. The T Sisters then join a full ensemble for a gorgeous rendition of the Mamas and Papas’ “California Dreaming” that sends sparks through the space-time continuum. Lesh, Peck, Crosby and the Brothers Comatose are all on board here with Tea Leaf Green’s Trevor Garrod on keys as the band delivers another stellar blast from the past. The jam features Lebo and Lesh trading hot licks again as the sound of 1967 ripples through with a vibrant resonance. It’s clear to see Lesh takes great pride and responsibility in living up to his heritage as a son of one of the counterculture music scene’s primary trailblazers. The same is true for Lebowitz and his role in the scene, becoming one of the leading players at Terrapin and developing a strong chemistry with both Leshes in the process. ALO’s Zach Gill joins with the Brothers Comatose for a joyous take on the Turtles’ “Happy Together”, though it’s somewhat left in the dust by what follows. Oakland-based vocalist Lesley Grant fronts the band for Sly & the Family Stone’s “Stand”, which starts a bit tentative but builds powerful momentum when Grant sings lyrics like “Stand, you’ve been sitting much too long” and “Stand, Don't you know that you are free, Well at least in your mind if you want to be…” The players crank up the song’s funky outro for an extended jam that lights up the night as the music seems to play the band in a rousing call for resistance to oppression. The set returns to Surrealistic Pillow with Tea Leaf Green’s Garrod taking the Marty Balin vocal on “Today”, backed by Carper and Nicki Bluhm in a resplendent Bohemian dress that looks like it was lifted from Grace Slick’s closet. The song seems to fit Garrod’s vibe like a glove as the surrealistic psychedelia envelopes the Fillmore once again. Then Bluhm steps forward to front the group for the climactic “Somebody to Love”, featuring Sears crushing the low end with smoking solos from Lebo and Darren Ney of the Gramblers. The set may have only been 90 minutes, but it feels like a full night due to the sharp arrangements, soul-stirring harmonies and dynamic performances of such historic songs. The entire show is a mesmerizing flashback to the Fillmore’s original glory days that would surely make the late Paul Kantner and Hunter S. Thompson proud (may the gods rest their surrealistic souls.) The entire cast returns for a full harmonic convergence on the Beatles’ “All You Need Is Love”, re-conjuring the optimistic hope for humanity that has run through the entire set. Moonalice vocalist/guitarist/Bay Area impresario Roger McNamee sums that vibe up at the song’s conclusion when he assures the audience, “We will win in the end, remember where you come from.” And that, as Hunter would say, was the handle for the evening. Photos courtesy of © Jay Blakesberg. No photos may be reproduced or reprinted without permission in writing from the photographer.